The biggest reveal at IAC was Elon Musk’s plans for terrestrial use of his reusable rockets: 30 minute to one hour flight times, for passengers or cargo, from anywhere to anywhere on Earth. Oh, and all that for a price comparable to an airline coach ticket. This confirmed Rod Martin’s longstanding predictions not only regarding this application, but that the real purpose of the SpaceX offshore landing ships was the facilitation of intercity travel, due to the noise restrictions at major airports. You can’t just launch and land rockets at LaGuardia or Heathrow. In SpaceX’s video illustrating the idea, passengers take a large boat from a dock in New York City to a floating launchpad out in the water. There, they board the same rocket that Musk wants to use to send humans to Mars by 2024. But instead of heading off to another planet once they leave the Earth’s atmosphere, the ship separates and breaks off toward another city — Shanghai. Just 39 minutes and some 7,000 miles later, the ship reenters the atmosphere and touches down on another floating pad, much like the way SpaceX lands its Falcon 9 rockets at sea. Other routes proposed in the video include Hong Kong to Singapore in 22 minutes, London to Dubai or New York in 29 minutes, and Los Angeles to Toronto in 24 minutes. Combined with hyperloop for shorter distances (Los Angeles to San Francisco, for example), this would put most of the planet’s population within 30 minutes of each other. And all of it within 30 minutes of space. All for airline prices. Fans of Heinlein saw this coming. But this is genuinely revolutionary. And only decades overdue. More information at The Verge. But this video will blow you away. 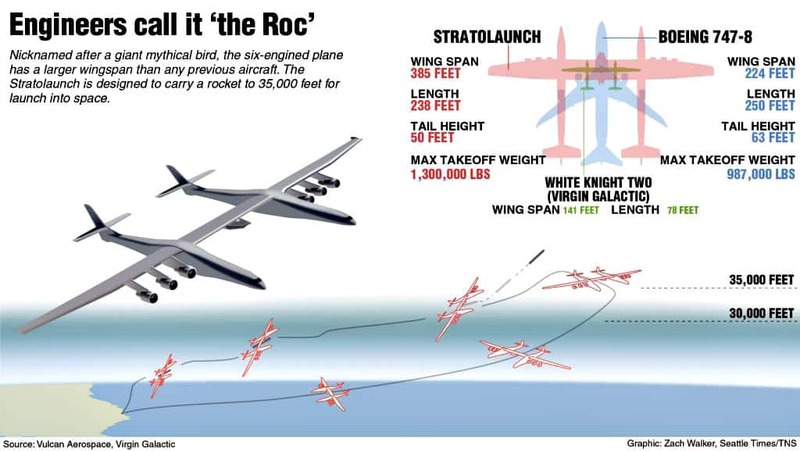 The world’s biggest airplane hit another milestone this week with the completion of the first phase of engine testing at California’s Mojave Air and Space Port, according to Stratolaunch, the space venture backed by Microsoft co-founder Paul Allen. The Global Space Law Center at the Cleveland-Marshall College of Law was developed due to the rapid growth of the private space industry, the university said. That growth has increased the demand for lawyers trained in the complex international and domestic aspects of space law and policy. DOD Secretary James Mattis said he’s open to funding new space programs if Congress delivers on the military spending hike the White House has sought. “In space, we need new starts in order to take advantage of what industry can deliver if we are willing to invest there,” Mattis said Sept. 20 during a keynote speech at the annual Air Force Association Air Space Cyber conference here. Air Force leaders generally agree that the service will need more skills in three key areas: space, cyber and intelligence. Where that talent will come from is still a matter of debate. Lt. Gen. Maryanne Miller, chief of Air Force Reserve, says many of the specialized space and cyber operators the Air Force hopes to add to its ranks are likely to be part-time reservists. Miller recently sat down with Gen. John Raymond, commander of Air Force Space Command, to discuss this very topic. The command is leading a long-term project to sharpen space warfare skills in the Air Force and prepare for future wars against peer competitors. 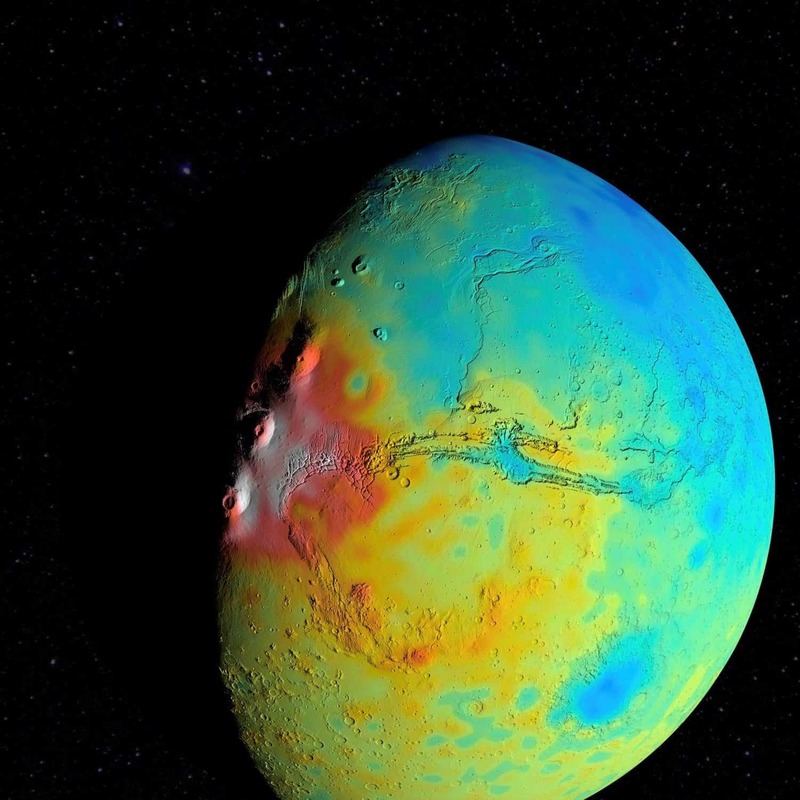 A new map of the thickness of Mars’ crust shows less variation between thicker regions (red) and thinner regions (blue), compared to earlier mapping. This view is centered on Valles Marineris, with the Tharsis Montes near the terminator to its west. The map is based on modeling of the Red Planet’s gravity field by scientists at NASA’s Goddard Space Flight Center in Greenbelt, Maryland. The team found that globally Mars’ crust is less dense, on average, than previously thought, which implies smaller variations in crustal thickness.